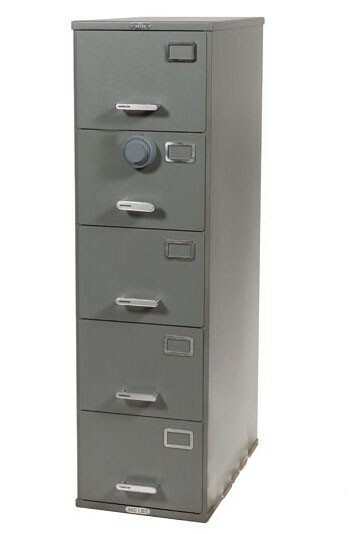 ArmorStor™ High Security filing cabinets are the ONLY secure locking cabinet on the market engineered exclusively for the top security of documents, HIPAA patient records, valuables or classified, confidential or top secret information. When compliance requirements dictate security, the ArmorStor™ file cabinet is the choice of healthcare, business and enterprises offices worldwide. Features Five (5) Drawer - Legal Size | Inside Drawer Dimensions=10¼H x 15¼W x 24¾D | Weight: 520 lbs. When security, access control and compliance of vital documents, and records are a priority, best practices dictate a high security locking file cabinet for proper storage. Currently pending a burglary rated file cabinet test, the ArmorStor is the most secure file cabinet with locking combination dials or electronic locks available on the market today. This item currently has a 30-45 business day lead time for arrival due to high demand. High security storage for HIPAA security, confidential records, top secret information and more. 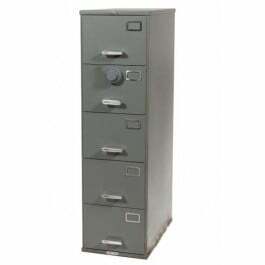 This 5 drawer filing cabinet is tested to GSA approved Govt. and Dept of Defense security requirements.